NUHW had a hugely successful bargaining year, winning 16 contracts covering 8,000 members. We are currently bargaining seven more contracts. Seton Medical Center and Seton Coastside: In November, Seton members settled a three-year contract that guarantees 3 percent wage increases each year, including market adjustments for certain classifications. The agreement includes none of the takeaways that SEIU agreed to at other California hospitals owned by same company, New York hedge fund BlueMountain Capital Management and its Verity Health System. NUHW members successfully fought reductions in paid time off and severance pay, a higher hour threshold for part-time employees and benefits eligibility, and the elimination of past practices, extended sick leave, education leave, and jury duty pay. Strong member participation in bargaining and workplace actions bolstered members to victory. Members were also strong on the external front and delivered an effective message to community stakeholders. On October 15, NUHW co-sponsored a town hall meeting to discuss the state of health care at Seton since the takeover by BlueMountain. With San Francisco Supervisor Jane Kim and Daly City Vice-Mayor Dave Canepa acting as facilitators, dozens of community members and Seton caregivers testified on a number of critical issues impacting patient care. Seton’s NUHW members celebrate a contract victory! St. Joseph Health – Sonoma County: Members at Sonoma County’s two St. Joseph Health System hospitals ratified contracts in June — the first contract for 160 Petaluma Valley Hospital caregivers and the second for more than 600 Santa Rosa Memorial Hospital workers. The three-year contracts include an immediate 6 percent market-adjustment increase for roughly half the workers at each facility, 5 percent across-the-board increases in the first and second years of the contract, and a 3.25 percent increase in the third year. The contracts also include a health insurance premium freeze and no further changes to benefits for the life of the contract. During the contract fight, workers testified before North Bay Jobs With Justice’s Workers’ Rights Board on February 20 about declining working conditions at the two hospitals before a panel of religious, community, and labor leaders. Jobs with Justice published a report of the panel’s findings and presented it to the hospital’s CEO. St. Joseph Health – Humboldt County: In April, workers at Redwood Memorial Hospital in Fortuna and St. Joseph Hospital in Eureka won a three-year contract that calls for an immediate 5 percent across-the-board increase, followed by a 2 percent raise in the second year and a 3 percent increase in the final year. By the end of the second year, no NUHW member at either hospital will make less than $15 an hour. Members also won a voice in the hospital’s staffing and safety policies through the hospital’s Safety Committee and a joint labor–management committee. During the contract fight, members raised community awareness about St. Joseph’s poverty wages, culminating in a report and community forum about the harmful impacts these low wages have on patient care and safety, public health, and the community. This year we also organized a residual group of 44 service workers at St. Joseph Eureka, who will vote this week to ratify a tentative agreement to merge them into the larger bargaining unit and cover them under that unit’s contract. 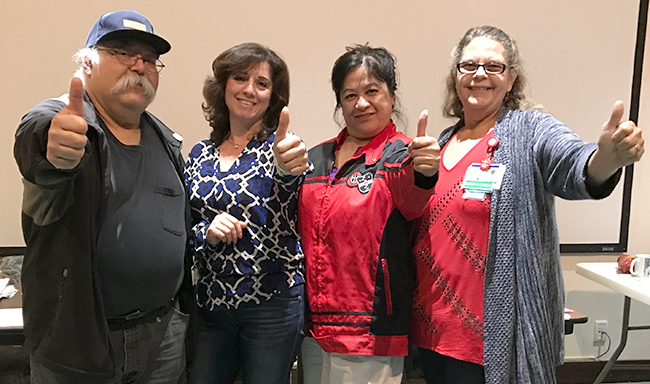 Kaiser Permanente: After a five-year struggle, we settled first-time Kaiser contracts for 3,750 members in all four bargaining units and won on staffing, wages, and pensions. We first settled a contract for Northern California’s Integrated Behavioral Health Services Chapter (IBHS) — a breakthrough that paved the way for settling contracts for Northern California’s Optical Chapter and Southern California’s Healthcare Professionals Chapter (HPC) and Psych-Social Chapter (KPC). This November we settled a second contract for Optical. In May 2016, Courage Campaign, an online advocacy organization with more than 1.3 million members, honored our Kaiser mental health clinicians with the United in Courage Award. The award cited clinicians’ activism throughout 2015, a year that began with a week-long statewide strike — 65 picket lines at Kaiser facilities throughout California — that generated vast press coverage and brought much-needed attention to Kaiser’s systemic neglect of mental health patients and its failure to comply with state and federal mental health parity laws. North American Health Care: In August, members at North American Health Care, which includes three nursing homes in Sacramento’s North Valley region — Cottonwood Health Care nursing home, Woodland Nursing and Rehabilitation skilled nursing facility, and University Post-Acute Rehab — ratified a new 29-month contract ending December 31, 2018. This contract includes improvements in wages, uniform allowance, and bereavement leave. 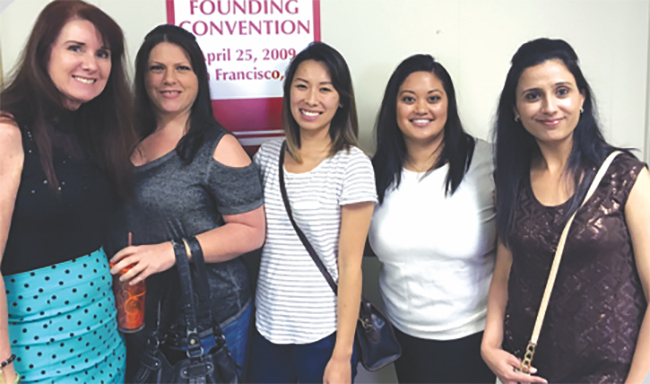 San Francisco Nursing Center: After two strikes and a year of difficult bargaining with a new employer, members ratified a three-year agreement in July that includes quality health insurance and guaranteed annual wage increases. The victory came after strong support from community groups and elected officials in the San Francisco community. Salinas Valley Memorial Hospital: After a protracted campaign, members settled a four-year contract that guarantees them a voice in the workplace, job security, protection against subcontracting, and wage increases totaling almost 11 percent. 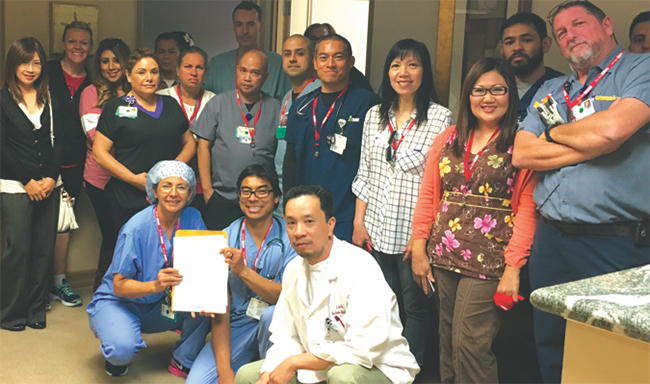 NUHW members also retained the highest amount of paid time off among Salinas Valley Memorial’s unionized workforce. The victory was a result of high member involvement and a variety of tactics — from leafleting, picketing, outreaching to the board of directors, to opinion pieces penned by our members and labor leader Dolores Huerta. 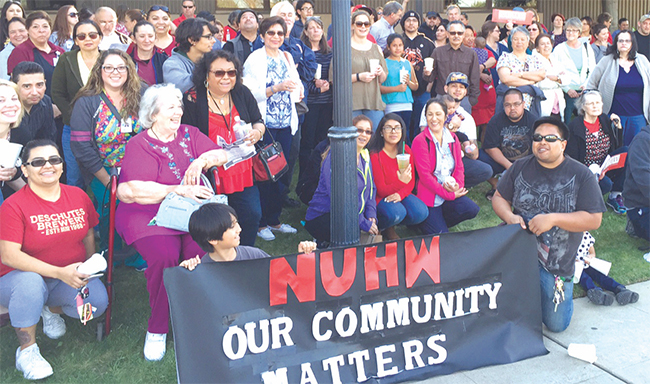 NUHW members at Salinas Valley Memorial Valley rallied the community during their contract fight. Hazel Hawkins Memorial Hospital (Hollister): Members settled a second contract in February that included 4 percent wage increases each year of the four-year contract. The agreement also includes a 2.5 percent longevity increase for those with 15 years at the hospital and another 2.5 percent for those with 25 years at the hospital. The contract also included no change to the employee portion of healthcare premiums, strengthened seniority language, and increased job protections. USC Keck Hospital: After a 10-month campaign where we demanded accountability from USC, members finally won parity with other USC workers on retirement benefits and tuition assistance; USC-paid health insurance for workers and their families; guaranteed annual wage increases that take into account their experience and years of service at USC’s Keck Hospital; and most important, a voice in the hospital’s staffing and safety policies through a Patient Care Committee. Members led the way in the campaign, garnering support from elected officials, educating the public through traditional and social media, sharing a video that exposed USC’s poverty wages and declining patient-care standards, picketing the hospital for one day, and striking for another day. Due to our momentum, when we finally served notice of a three-day strike, the employer came back to the table where we eventually settled the contract. USC Sodexo: Sodexo-employed dietary, food service, and nutrition workers at Keck USC prevailed against many takeaway proposals and settled a contract that provided for a 12 percent pay increase upon ratification. Members also received relief from the rising cost of health insurance premiums, including an 11 percent reduction in employees’ cost-sharing. Members won this contract by uniting with NUHW-represented workers Keck USC and waging an aggressive campaign against Sodexo and USC. They struck for one day in solidarity and gave notice for a three-day strike. We placed ads in the USC student newspaper; published a video that called USC out for hiding behind Sodexo to pay poverty wages to its workers; produced member-interview videos that demonstrated the effects of low wages and inferior benefits on the workforce; used social media to educate and rally the public; and spoke out at Los Angeles County Board of Supervisors meetings. The Sequoias – Portola Valley: Members settled a second contract in January, winning an 8.5 percent wage increase over three years and 3 percent in retroactive pay. In the second and third years, workers will receive lump sum payments based on their annual wages. Children’s Hospital Oakland: In the past few months of bargaining, we reached a number of tentative agreements. With two election victories this year that doubled our membership at the hospital, we are now bargaining for 900 members. Fountain Valley Regional Medical Center: Management has continued to stall; we proposed 50 bargaining dates, but in five months Fountain Valley agreed to just seven. We have proposed 22 contract articles, including grievance and arbitration procedures and a patient care committee. Management has responded to 13 of our articles and we have reached three tentative agreements. We are increasing pressure on the hospital’s management to quicken the pace of bargaining and settle a fair contract. Fountain Valley’s NUHW members negotiate for a fair contract. Mission Neighborhood Health Center: Despite the presence of a federal mediator, the employer has refused to put forth reasonable proposals. MNHC has refused to offer wages that keep up with the exorbitant cost of living in the Bay Area. Management improved its wage proposals under threat of an informational picket. Brius Healthcare: NUHW represents caregivers at two Brius nursing homes in Marin County. Our bargaining committee presented management at San Rafael Healthcare and Wellness Center with a full proposal. All economic issues are still unresolved, as are staffing and training issues, but the employer has improved its wage proposals. Bargaining is also under way at Novato Healthcare Center. NUHW has been tracking Brius’ alarming patient care record with a website, BriusWatch.org, that includes a video and blog. Kindred Hospital Bay Area: Our new bargaining committees, one representing registered nurses and the other representing service and technical workers, engaged in our first session of contract negotiations in September. Bargaining so far has focused mostly on non-economic proposals. Kindred Hospital Bay Area’s NUHW members.